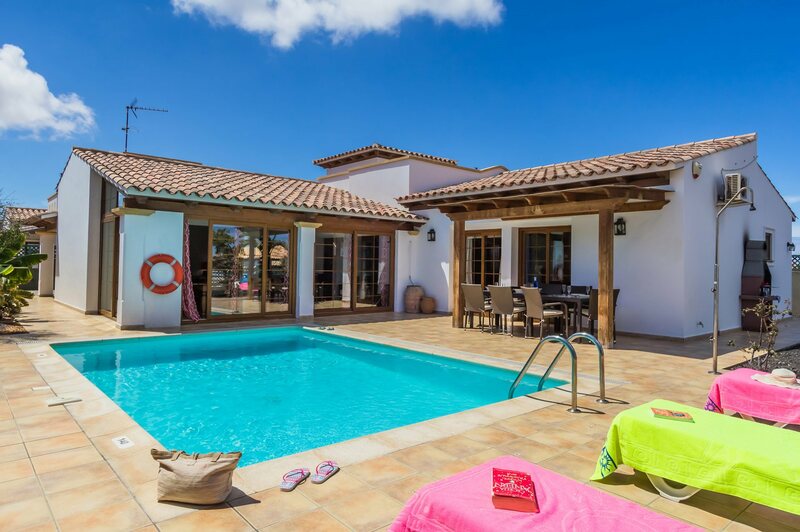 Villa Sherry is a delightful 4 bedroom villa in a good location in Corralejo. There is a choice of shops and places to eat within a short walk. The beach and centre of this lively resort is around 10 minutes' drive away or just a little over 20 minutes on foot. What's more the villa is tastefully decorated inside and with plenty of space outside is great for a relaxing holiday. WiFi, pool heating and air conditioning/heating in the bedrooms are included. A high-quality villa, tastefully decorated inside, and with a private pool. Just a short drive to Corralejo centre too. Perfect! Outside, Villa Sherry walls surrounds the private, swimming pool on 2 sides securing a good deal of privacy. There is ample terrace space to relax and enjoy the Canarian sunshine, with an exterior table and chairs, plus a BBQ - ideal for dining alfresco. At the side of the villa are stairs leading to a small roof top terrace with a table and chairs. The villas entrance gates open onto the private parking area and front door. The open plan lounge and dining area is inviting and tastefully decorated with dark wood features. There are comfortable sofas and a flat screen TV, a feature fireplace as well as a dining table and chairs for entertaining your party. Two sets of patio doors overlooking the garden and pool, ensure plenty of light enters the room. The fully equipped kitchen is adjacent and has access to the pool terrace. There are 4 bedrooms - 2 doubles and 2 twins - in the villa, as well as 2 bathrooms, one of which has a separate shower cubicle and connects the hall to the second double bedroom. Two of the bedrooms - one double and one twin - have direct access to the pool. Villa Sherry is around 10 minutes' walk to the shops and restaurants , with El Campanario Shopping Centre is a little over 10 minutes further. It has a traditional feel and plenty of fashions shops, a supermarket and restaurants so you can shop till you drop. The beach of Waikiki and resort centre is 10 minutes' drive away. What's more it's 10 minutes' drive to Grandes Playas Beach and the spectacular sand dunes. If that isn't enough the Acua Water Park is just a 5 minute trip by car . Villa Sherry is on the same complex as our Villa's Sherry II and Jardin Canario. There is a mini market for your daily essentials a 10 minute walk away. For those who enjoy a bit of retail therapy, Corralejo has numerous shops as well as 2 good shopping centres - Las Palmeras and El Campanario. Both have several high street named shops and supermarkets. The lively main promenade leads through to the music square where you can often find live tunes playing as you shop. There's a local market to explore on a Tuesday and Friday. There are some restaurants and bars within walking distance. Corralejo centre itself has a big number of restaurants as well as some nightlife. You can enjoy a meal at one of the numerous restaurants in the main square which often has live bands playing, 10 minutes' drive away. There are also good quality local restaurants at Corralejo Harbour. Waikiki Beach is in the centre of Corralejo, whilst the stunning beaches of Grandes Playas and Flag, which are famous amongst windsurfers, are both around 10 minutes' drive away. The Acua Waterpark is 5 minutes' drive from Villa Sherry and has waterslides, a wave pool, crazy golf and a bowling alley - great for a family day out! Kids will also love the Oasis Park Zoo and Botanical Gardens located in La Lajita, about 1½ hours south of Corralejo. The zoo has a free bus service between the 2 resorts for those not wanting to hire a car. The splendid sun dunes are what Corralejo is famous for. The Dunes as well as the beaches are part of the nature park. The beautiful expanse of sand stretches for miles, with a clear view towards Lobos Island. The dunes are home to the International Kite Festival which takes place every November, attracting people from all over the world who bring kites of all shapes and sizes. This is a top destination for sun worshippers and surfers too. If you fancy a game of golf, Mirador de Lobos Golf Resort in Corralejo is located close to Villa Sherry. Or, for a larger course, try those in Caleta de Fuste located on the East Coast just after the airport. You can take a boat from Corralejo and visit neighbouring island of Lobos. There are some excellent walks on this little island. Villa Sherry is not available to book for season as it is sold out. Take a look here at the Fuerteventura villas that are currently on sale. Tennis court facilities and equipment for hire are available at many hotels and complexes throughout Corralejo.Young children need to be supervised. The villa was amazing. It had everything we needed for our stay. Fantastic stay. Beautiful villa, perfect for our group of 8. We'd happily book here again. Very nice villa and pool. The candles were a lovely touch. We will be booking with Villa Plus again.